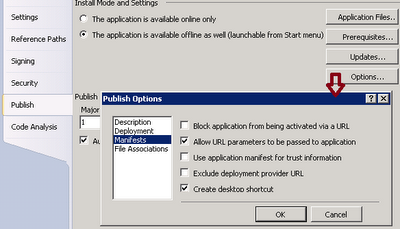 An application deploying by ClickOnce deployment can be configured to available online only or to available through the start menu. By selecting "The application is available offline as well (launchable from Start menu)" option from the Project Properties -> Publish Tab, it can make available in offline mode as well. This will create a shortcut on the user's desktop with a standard icon. Then to add a custom icon, go to the “Application” tab, browse and select the preferred icon. this is for vs2010 right? how about vs2005?